This rose is from a beautiful bouquet my husband gave me for Valentine’s Day. Isn’t the yellow incredible? I’ll be off again tomorrow. An update: my painting class is going better! I wasn’t having a great time last week. Our instructor is a very nice guy, but kind of “hands-off,” in that he gives almost no direction. I probably should have taken a beginner’s class before this one, but the course description said, “beginners welcome.” What that actually means is, “You will be totally lost the first two weeks. Good luck to ya.” After much experimentation, I’m finally getting the hang of it and enjoying the whole process. My painting is not great, but it’s not horrible either. I’m glad I stuck with it. This entry was posted in photography and tagged painting class, perseverance, yellow and red roses. Bookmark the permalink. I’m so glad to hear your class is going well! Sometimes it takes a few tries to get back into the swing of things. What a gorgeous bloom. Your husband knows his roses! Thanks! I should mention that I also have a very talented painter next to me in the class and she’s been a huge help. 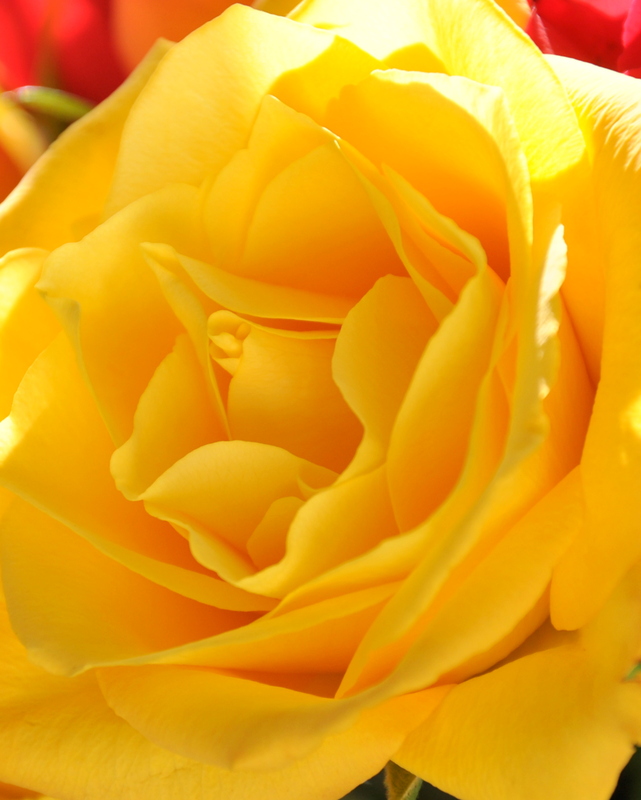 That rose is a delicious shade of yellow and definitely announcing its presence. I hope that my PhotoShop class is helpful and not one where I am too much on my own. One thing I remember about my Photoshop class: don’t fall behind. Raise your hand the minute you don’t understand something or you’ll be really lost. Each step builds on the next one and it’s critical to have all of them down. Photoshop is so much fun, though! What a perfect rose! I love the shade of yellow (yellow roses are my favorite) and the bloom looks flawless. Glad your class is going better. Will you be posting any of your artwork here? I love yellow roses too, but have never been able to grow them for some reason. Would love to have this shade in my garden someday. Good to hear it is going better. “Beginners welcome”. I will bear that in mind… It just means you are tolerated but not necessarily hepled, if I got it right. Incredibly intense yellow. Very nice. You definitely got it right! I finished the book last night, Caroline. It pretty much left me breathless. One of the most descriptive writers I’ve ever encountered. Thanks so much for putting it out there. I am so glad you liked it. He is wonderful. I could really see the book. There is a movie but I haven’t watched it. I liked the book so much that I am almost afraid the movie would spoil it. I feel the same way about the movie. They often miss the mark. I’m so pleased to read that you are enjoying your painting classes more. I hope you’ll post some of your work at some point. Monday is a holiday … officially “Family Day” in Ontario … lovely to have a break during the February Blahs! Have a great weekend! Cheryl, I’m still totally lost, but the fog is lifting just a bit each week. I love mixing colors and painting–it’s figuring out how to add layers that has me puzzled right now. My instructor liked my first painting, so that’s encouraging. Well, the first painting is not finished yet. Believe it or not, the background is driving me nuts. (I thought that would be the easy part.) I was too heavy-handed at first, now need to fix it. The problem is, my instructor already has us on to the next painting, so I’ll have to concentrate on that now. He’s moving really quickly, but like I said, this really isn’t a class for beginners. I may end up with eight unfinished paintings at this rate. 😉 That’s OK, I’ll enjoy finishing them later. Wow, that is nice to hear. Thank you, and welcome!